I had several options for a game this week. But one of the playoff games was my top priority. I had been to an epic 4-4 draw between Bognor Regis Town and Godalming Town in last seasons playoff games, which Bognor won on penalties, before beating Dulwich Hamlet in the final. First choice for me was Merthyr Town v Swindon Supermarine, as I had always wanted to go to Merthyr and had a soft spot for Supermarine after watching them a couple of times this season. But a couple of things put paid to this visit. Firstly the fact that I didn't have anyone to go with and to help out with fuel costs. And the fact that I had to be up at 4am both on the day of the game and the day after, as I was doing overtime. Altrincham v Brackley in the Conference North playoffs was discounted for a similar reason. As was Kings Lynn v Sheffield in the Northern Premier. So I was left with a few options. The 2 that were favourite were Faversham Town v Hythe Town and Thamesmead Town v Witham Town, both in the Ryman League playoffs. The latter was half the distance and slightly less time, so I opted for that, even though it would mean a gruelling commute through London rush hour traffic. Looking through the websites of both teams, I didn't recognise any of the players for either side. Thamesmead had finished 3rd with 88 points, 9 ahead of Witham in 4th. The winners of this game would be playing the winners of Maldon and Tiptree v Aveley, who were playing at the same time. The home side, Maldon were unbeaten at home, so I was hoping it would be them, as the highest ranked side got home advantage. The game would be on Sunday and I was planning to go to it. With me giving up my Cashline job with Wycombe and my parents away, it would be the idea opportunity to do a Sunday game. I had previously been to Thamesmead, just to take photos of the ground, way back in 2005 on the way back from Welling. They were in the Kent League at the time, and I would be very surprised if they had not had to improve on the ground, as it was pretty basic, although it was well kept and had a smart clubhouse from what I remember. 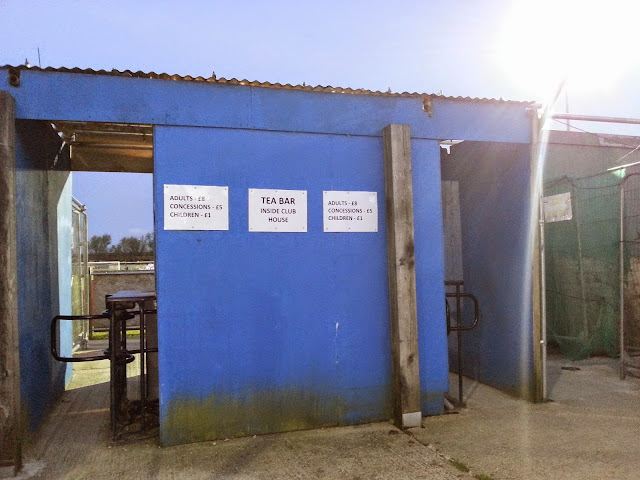 The people there were friendly too, which thankfully is the norm in Non League. As I had been working, I only had the afternoon free, and was planning to have dinner early and leave at 5.30, to allow an hour extra for traffic. In fact I left at 5.20 after demolishing a delicious home made pizza, confident that I would arrive well in time. My Sat Nav seemed to think so, with live traffic info, I should have arrived at 7.20, even with delays. This dropped down to 7.09 at one point, rising to 7.39 as I was going down the A40. It was at this point it wanted me to turn round and go on the M25, adding an extra 40 miles to the journey. No thanks. I was more or less going fine until I hit the Hangar Lane giratory, then it all slowed down. Crawling though London, on so called main roads, which were little more than back streets, and passing thorough mainly right grotty areas as well as well as a few landmarks like the London Eye and the River Thames. I'm not a huge fan of our capital city for the most part, and I can certainly see why lots of people take public transport, as the roads are pretty woeful. The estimated arrival time crept up to 8.15 at one point and the roads were slow all the way to the ground, thanks mainly to cyclists and buses slowing things right down. Eventually I managed to find a proper road, about 5 miles from the ground and it was a pretty decent journey for that part. I eventually arrived at a few minutes before 8, to find packed roads with cars parked on both sides. Luckily I found a space quickly and slung my car in it, before jogging to the ground, getting there just as my watch said it was 8pm. There was a smell of sewage in the air, and I was hoping that was not a sign that the game was going to be a stinker, as it turned out, I needn't have worried. After paying to get in and getting a programme, I was pleased to find out that I had not missed any goals. There was a crowd of 206, which may sound unimpressive, but at the corresponding league game, which was on a Saturday, there were just 40 at the game. 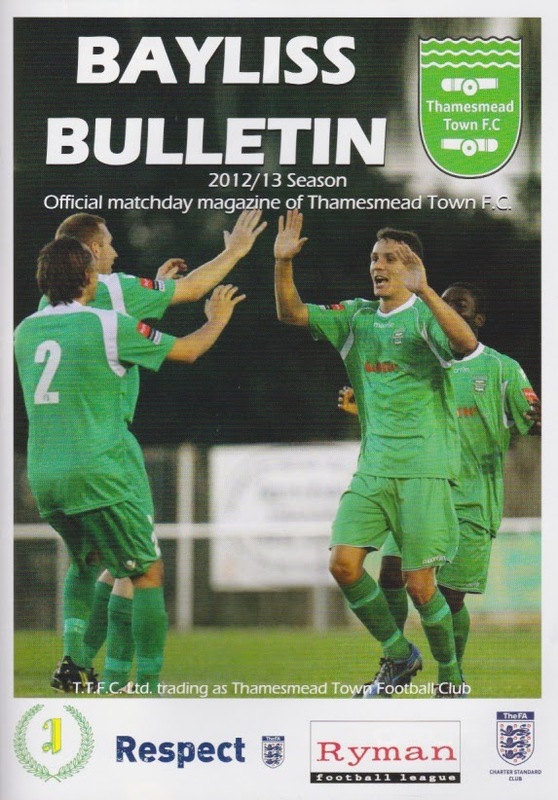 In that game, the visitors won 1-0 and Thamesmead were doing their best to make sure there would be no repeat this time. The job that their manager Keith McMahon has done is nothing short of fantastic. With the second worst average attendance in the league, he has put together a side that have every right to be fighting for the playoffs. They played good football too, dominating the first half and getting their reward on 21 minutes when Baff Addae was tripped in the box and Chris Edwards scored from the resulting penalty. They continued to have chances to extend their lead with Witham restricted to the occasional chance on the break, but it remained 1-0 at the interval. It was getting seriously chilly, so I rushed back to my car and got my coat. Even with that on it was still nippy without gloves. I thought I had spotted my Facebook friend Mishi, who is a Dulwich fan during the first half, but wasn't 100% sure as I'd not seen mention of him going, and he didn't looks like a dead ringer for Ray Winstone as he did in one of his profile pictures! I didn't fancy going up to a complete stranger and getting it wrong, but luckily he spotted my Wycombe top and so I spent the second half with him and some Dulwich fans and spent the rest of the half talking about football and checking out some of the other playoff scores. On the pitch, it was the complete reverse of the first half with Witham having the lions share of play. Like their opponents, the visitors got a penalty on 54 minutes, with Rob Whitnell converting. Witham continued to dominate, having several good chances and the home side were restricted to chances on the break. But they got lucky on the balance of play, but there was no luck about the finish that gave them the lead for the second time, the best of the night. The Witham keeper sliced his clearance, but still Baff Addae had plenty to do as he lobbed the defence and keeper from way out. It was all square again, pretty much straight away though. A cross was put in and although Sam Taylor saw his initial shot saved, he followed up on the rebound to equalise. But instead of spurring Witham on to victory, Thamesmead started to have the better of the game again. Stuart Zanone got the winner on 78 minutes and although there were chances for both sides after that, it was the home side that looked more likely to score. 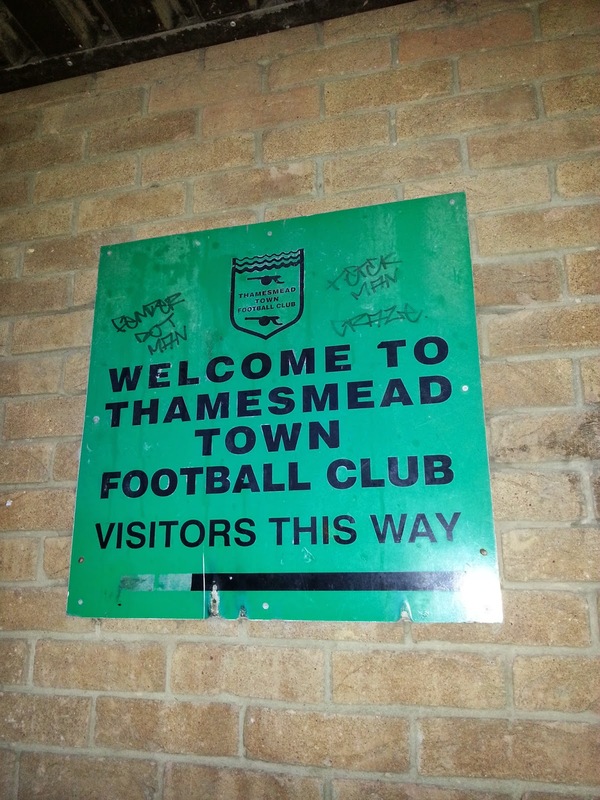 But 3-2 was how it stayed and so it was Thamesmead that went through to the final on Sunday, at Maldon & Tiptee, after they beat Aveley. I am hoping to go to this game. After the game, I said goodbye to the Hamlet fans and made progress a bit quicker, though it was still slow on some of the inner city roads. Once I got to Hangar Lane though, it was a lot quicker and I was back home just after 11.30, staying up for about half an hour before going to sleep. BAYLISS AVENUE is much changed since I last paid a flying visit in 2005. And for the better too. Most impressive is on the left side of the ground as you come through the turnstile. This stand is yet to open but looks impressive, being raised above the ground and having some facilities behind it, maybe more clubhouse facilities. What appears to be the old main stand is now behind the goal, it is one of those metal ones, holding around 150 fans. There is cover behind the other goal too, with open flat standing along the dugout side. The clubhouse is not as bright and airy as I remember it, looking a bit gloomy now and instead of seeing the pitch out of the window now, you just see a load of building gear and the back of a stand, hopefully they will tidy that up in the future as the ground evolves.